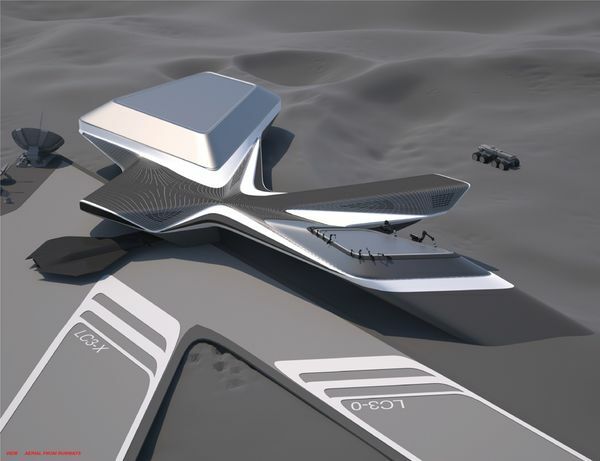 This Digital design of the Lunar Crater Cultural Center (LC3) is based on a vision that the proposed design is not an end product, but the starting point for an ever-evolving building on the lunar surface. 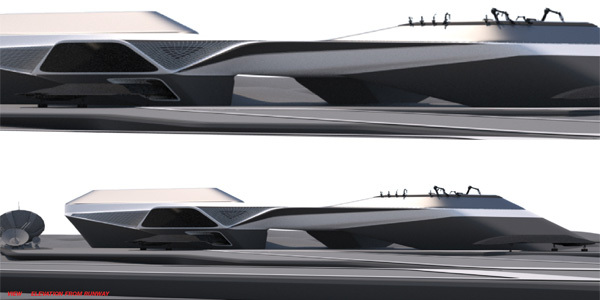 By utilizing up and coming fabrication technologies like Counter Crafting, the LC3 would be a conglomeration of "3D printed" components. 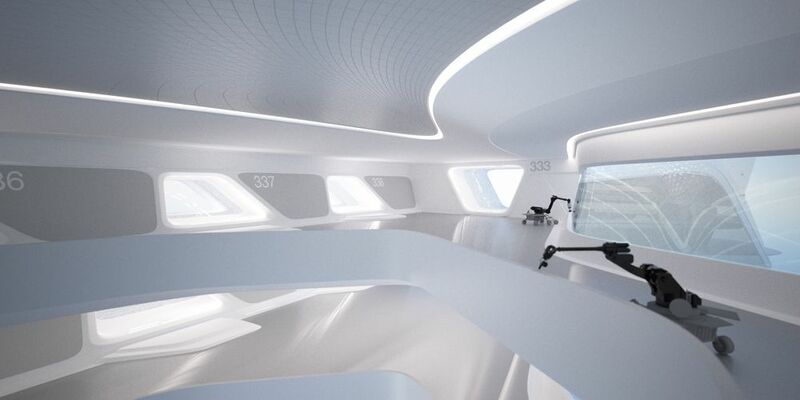 The technology would not only allow for minor modifications and refurbishment, but could potentially support the emergent expansion of the base building form to accommodate future programmatic needs. Situated at the scenic edge of the larger crater formation, the base LC3 building (LC3 Prime) remains integrated into a surface network of shuttle runways and launch pads. 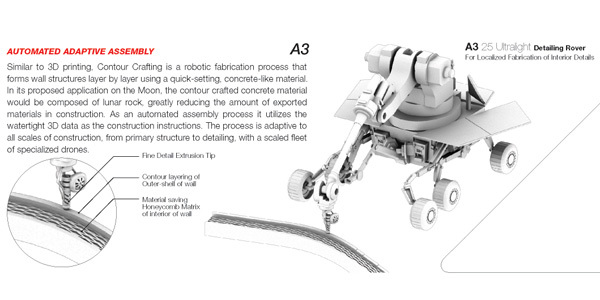 Its massing and formal language responds to the irregularity of the lunar surface by minimizing the surface area that is directly Contour Crafted upon the lunar surface and instead hover the majority of its massing. The touchdown points of the form relate to the discrete programmatic volumes (e.g. 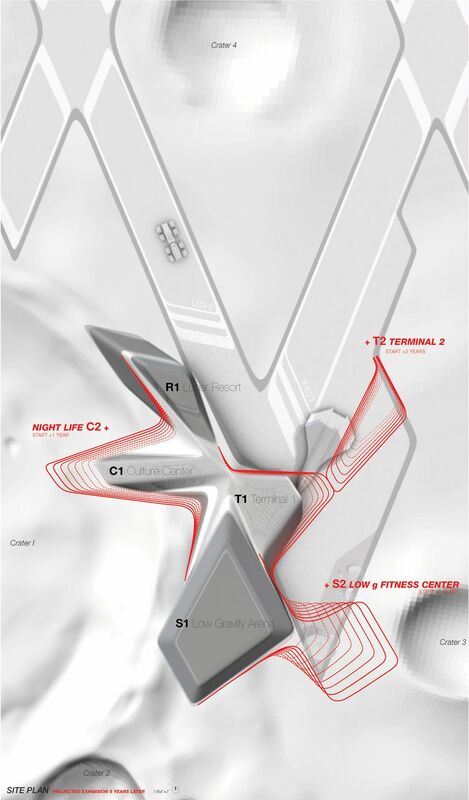 Terminal, Lunar Resort, Culture Center, and Sports Arena) which interconnect into a hovering mass of shared programmatic space. Programmatically, the LC3 Prime proposal accommodates what would be the essentials for its initial inauguration. 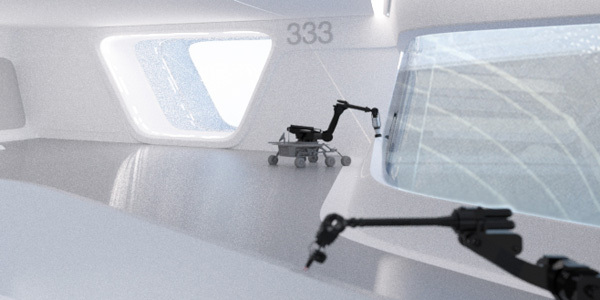 Considering that the Lunar Cultural Center is a destination in space tourism, primary program such as the Lunar Port Terminal, Resort, and Crater Observatory would provide environments that simulate Earth's gravity so as to allow a level of comfort for the stay of tourists (who would not need the training of astronauts). A level of spectacle and novelty is created by limiting the amount of program that is subject to the reduced lunar gravity. 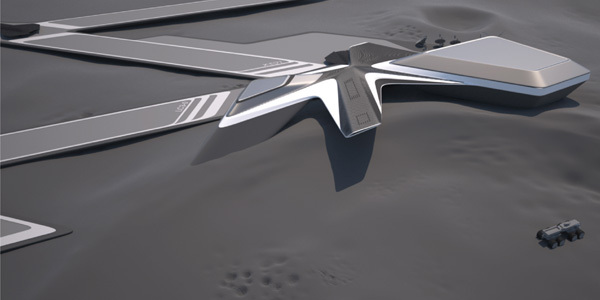 The creation of a Low Gravity Arena, for example, would provide a unique opportunity for practicing Earth sports and the Cultural Center would offer crater tours and Moon walking adventures. The primary challenge in executing any development on the Moon is the absence of any form of infrastructure on a site that is both remotely isolated and not easily accessible economically. 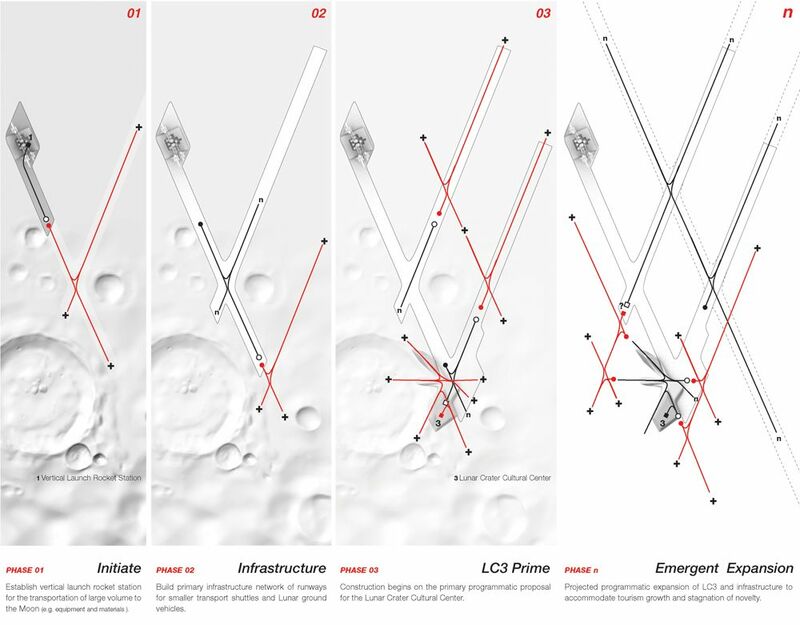 The proposed approach of a phased development lays out the primary infrastructure for travel to and from the Moon and the ground transportation that would make the construction possible. At the heart of the proposal is the emergent programmatic expansion of the LC3 and its infrastructural network so as to accommodate projected space tourism growth and the stagnation of novelty.